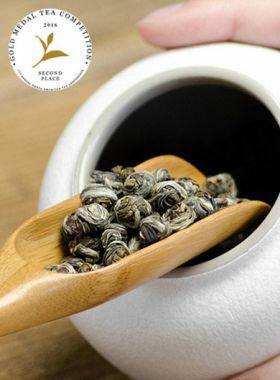 Curled into snail shape, covered with abundant white hair, it is a refreshing jasmine tea that can be infused for multiple times. For jasmine-scented tea, the most attractive thing is its fragrance. In the unique scenting processes that grant the tea this fragrance, the fresh jasmine flowers are mixed with the tea leaves so that the leaves absorb the soft, sweet aroma, which mixes wonderfully with the natural mellow taste of the tea itself. The aroma of this Snail Yu Luo green tea is rich and natural, comfortable and relaxing. 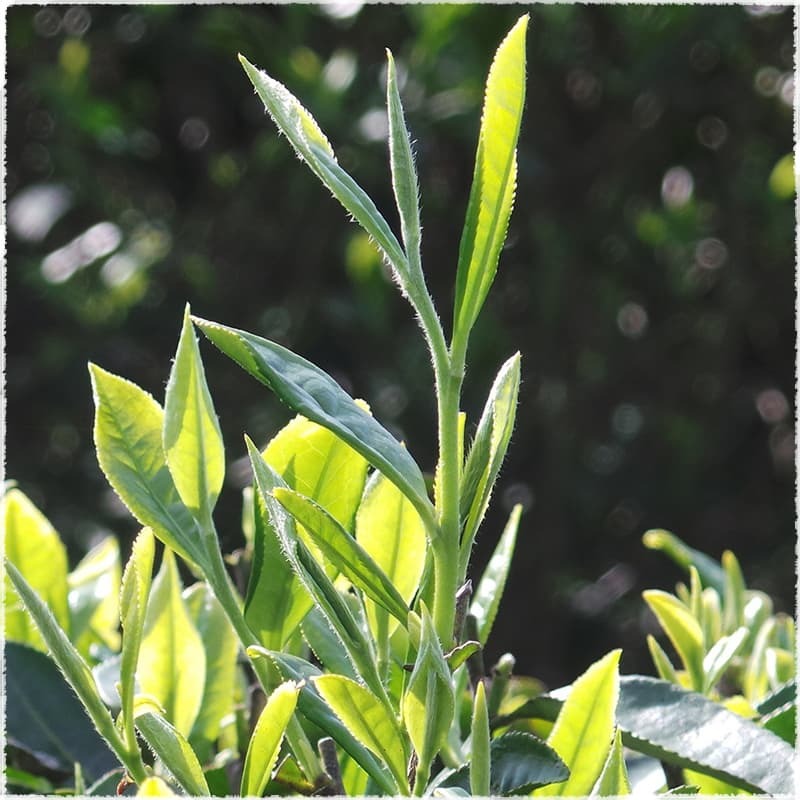 The floral fragrance melts throughout the tea liquid so that when we drink it, we can definitely feel its cooling sweetness; the material of this tea is one bud with one leaf, resulting in a thick, mellow brew capable of lasting through many infusions. Best of all, this tea can be enjoyed at almost any time during the day. 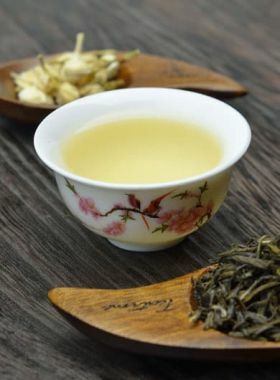 As well as being scented five times with jasmine flowers, this type of Snail (Yu Luo) Jasmine Green Tea has undergone a special process called Yi Ti, or Ti Hua (提花, “final scenting”) , done with the goal of further enhancing the jasmine’s intensity. 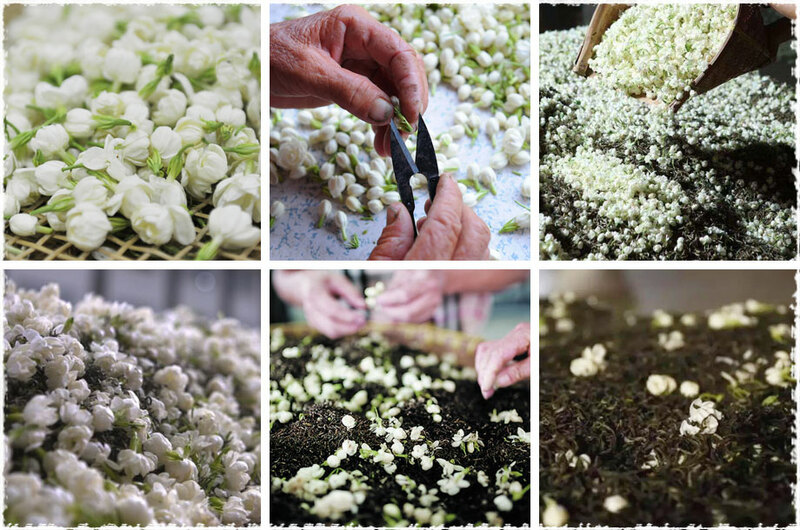 Only first-grade flowers are used for this, with their large petals, pure white color, and strong fragrance. In order to retain this intensity, the tea leaves and jasmine flowers are mixed for one more scenting, and afterwards do not undergo any further drying; generally, the final scenting stage takes 6-8 hours, and every 100kg of tea leaves requires about 6-8kg of flower petals. 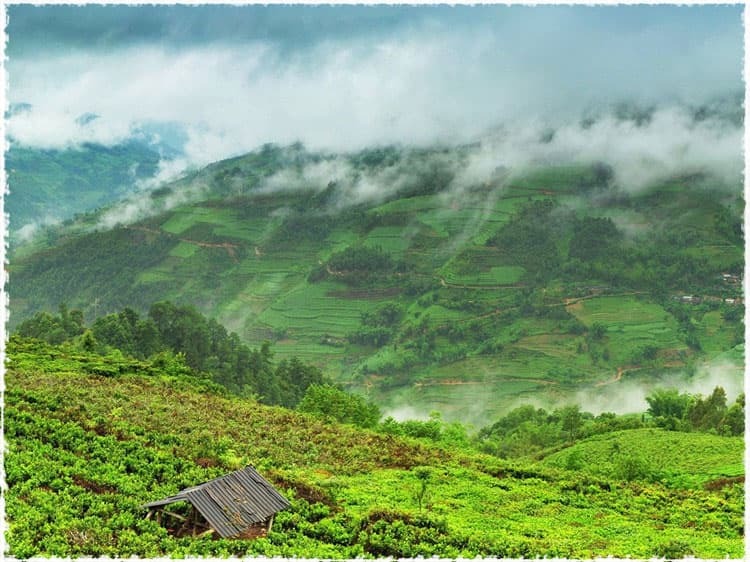 Nanling Tea Garden sits along the eastern bank of Lancang River at an average altitude of about 1500m. This garden is surrounded by rolling mountains always covered in clouds and mist, providing the perfect illumination, temperature, and moisture for tea growth - and along with this, only organic fertilizers are used, ensuring the safety and healthiness of the tea. Mr. Chen is the producer of this Jasmine Snow Bud Green Tea. He has been honing his craft since he was fifteen years old, and has worked with jasmine tea specifically for over forty years. As a result it has become extremely familiar to him, and he works it in his own special style - which has become one much sought after by tea lovers. 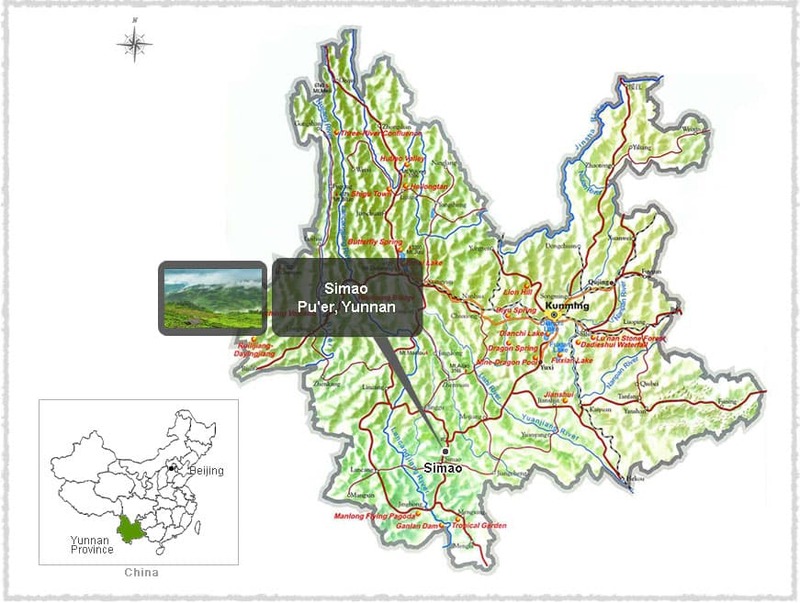 Simao is located in Puerh City, Yunnan, and has long been praised as a City of Chinese Tea. IT is also called Meng La, marking it as a place where tea culture has historically played a part. It is the beginning of the Tea Horse Road, or the southern Silk Road in history; this is a truly beautiful place, with its large mountain ranges and rivers and its pleasant climate, warm in winter and cool in summer. The jasmine used to scent this tea originates from Guangxi, and has earned its reputation nationwide. 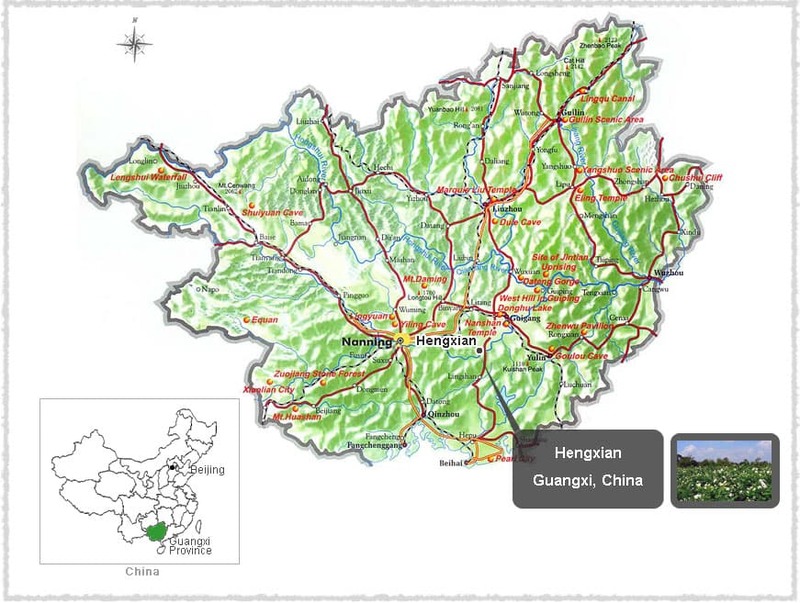 The most notable area of production is Hengxian, known as the City of Chinese Jasmine for its ability to produce flowers of both high yield and high quality. 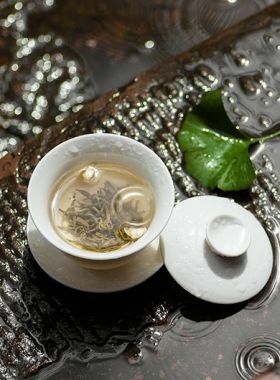 This tea is made from the Fengqing large-leaf subspecies of the Yunnan large-leaf. It propagates sexually and takes the form of an arbour tree, meaning that it can grow to over six meters tall. 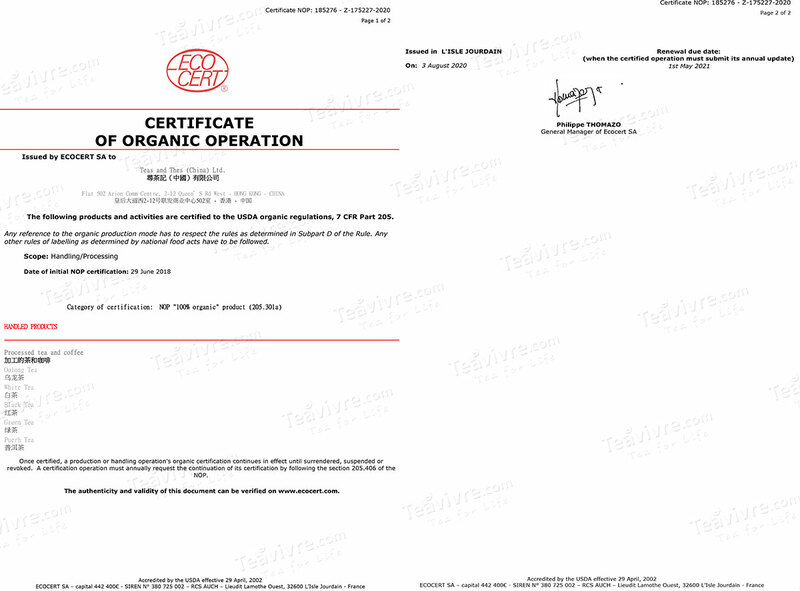 1984, the Fengqing large-leaf species was certified by the Chinese government as a national grade. It contains an abundance of tea polyphenols (30.2%) and catechins (13.4%), as well as 2.9% amino acids and 3.2% caffeine.